I take notes on my laptop while I watch screeners, but my notes for tonight’s season 2 finale are relatively short. That’s because every time I jot something down—a quote, a plot point, a character name I keep forgetting—I have to pause the screener and switch tabs. It’s not an ideal solution, but it usually works, except when I’m watching something I don’t really want to pause. Several things happen in “Caliban’s War,” and a few of them are pretty damn important, but most of the episode is spent hoping people we’ve come to care about aren’t going to die. It’s hard to pay attention to the smaller details when a monster is ripping a hole in the ship’s hull, I guess. Yet as suspenseful as this was, and as much as I think the second season has represented a leap forward in quality for the series, it’s a bit wonky from a structural perspective. 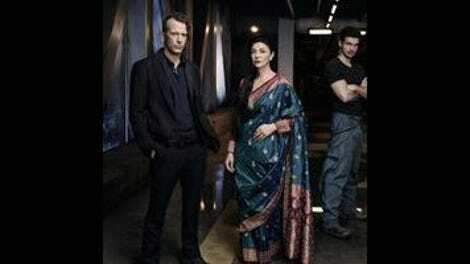 The end of Eros, and of Miller and Julie Mao’s story, happened at episode five, almost halfway through the season as a whole, and that left eight episodes to essentially build a new ongoing storyline—and while that new story wasn’t made from scratch, and while pretty much everything we’re seeing is connected by the threat (and possibility) of the protomolecule in its varying forms, it still made for a bit of clunkiness in retrospect. This is the subjective of all subjective judgments, but for most of its running time, “Caliban’s War” doesn’t feel like a finale. Oh, it’s a fine hour, and the end packs in some big punches that will surely shape the direction of season three, but this doesn’t feel like a payoff to what’s come before so much as it does a clearly up of loose ends. Consider Avasarala: there’s some thematic payoff for Bobbie (in that she tells a cowardly technician that it’s stupid to serve a bad leader, thus showing how recent events have changed her perspective on loyalty), and the standoff is legitimately tense, plotwise, nothing changes for her that we didn’t already know last week. Avasarala survives, thanks to some quick thinking by Draper and Cotyar. It’s a necessary event, but not a particularly conclusive one. Things on the Rocinante are bit more definitive, in that Holden finally gets to kill the thing he’s been hunting all these weeks. (Weeks in our time, at least.) 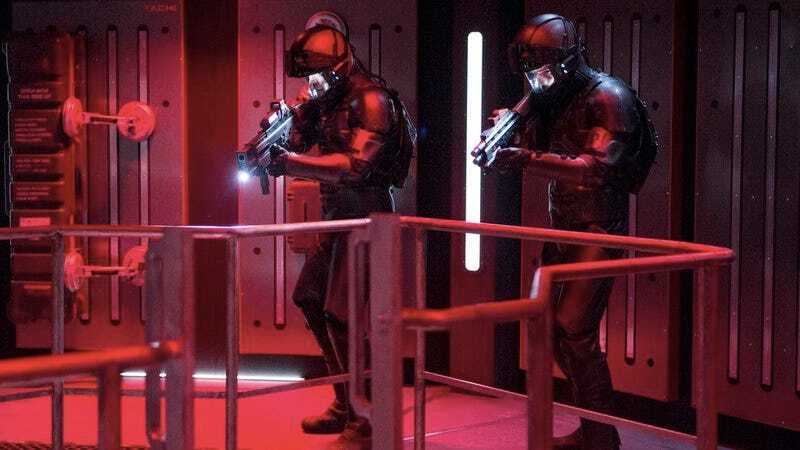 Only he doesn’t do the killing; when he and Amos go down into the hold to try and flush the protomolecule monster out, the creature gets the jump on him, locking Holden against a wall with a storage unit and forcing the rest of the crew into action. It’s here where most of the episode’s suspense comes from, as the possibility that Holden might actually die feels pretty real throughout. I was pretty sure he wouldn’t, but I also didn’t think Miller was going to leave us when he did, so it’s been established that this is a show that will occasionally kill off its nominal leads. Judged purely on its own, watching everyone struggle to come up with a solution that didn’t end with their captain being torn in half was fun, and it was gratifying to see Dr. Meng get a chance to help for once; he’s the one who finally figures out the problem, coming up with a plan to lure the creature out of the ship with a nuclear warhead. (The thing is drawn to energy, which is why it spends most of the hour trying to bash its way to the Rocinante’s reactor.) And it was great getting a chance to watch the monster up close. After a lot of glimpses and hints, “Caliban’s War” gives us plenty of time to gawk, and it’s worth the wait—the thing is recognizably human yet still alien, its body stretched and shaped in ways that seem both plausible and unsettling. Yet while we get more closure here than we do in Avasarala’s storyline (the thing does, after all, end up dead), it’s still surprisingly slight up until those last couple of minutes. We don’t learn anything knew about the monster, apart from the fact that it’s at least moderately intelligent and that it had a fail-safe device implanted in its chest, a bomb to keep it from disobeying. (This creature manages to tear out its bomb, which seems like a bit of a design flaw.) There’s no greater sense of consciousness, no unexpected moments of empathy between it and any of the Roci crew. The thing isn’t Meng’s daughter—we get that confirmed in the final shot—but it’s still a minor disappointment to have spent all that time getting to this point, only to have it be just another threat that needed to be eliminated. Really, were it not for the final five minutes or so, this would’ve been indistinguishable from a mid-season entry, which is where that structural wonkiness comes in; because if the end of Eros hadn’t taken up so much of the first part of this season, this would have been a mid season entry. That doesn’t make me less excited for season 3 (although I do wonder how long this bumpiness is going to continue), but it does make for an ending that doesn’t quite live up to everything that’s come before it. On a show as serialized as this one, a season finale needs to feel like whatever part of the story this season was focused on telling has been told, while laying down the possibilities for where the next part of the story might go. That’s sort of what happened here, but in fairly anticlimactic fashion. It could’ve been worse, but it also could’ve been better—and I’ve come to expect better from the series as a whole. Still, those last five minutes were pretty sweet. The Arboghast decided to go all in on its investigations of the Eros crash site, and for its troubles, the entire ship was dismantled mid-flight; it’s possible the crew survives this, but not very likely. Back on the Rocinante, Naomi tells Holden that not only did she not destroy the protomolecule sample, she also gave it to Fred Johnson when she thought she was going to die back on the Somnambulist. Her justification is that war is a constant, the protomolecule is in play whether they want it to be or not, and the Belt needs to be able to stand up to Mars and Earth in the war to come, or risk annihilation. I doubt Holden approves, but she may actually have a point. Because as bad as the protomolecule is, killing the creature on Ganymede didn’t solve the problem. The last scene of the finale has Dr. Strickland loading a frozen Mei onto a ship carrying hundreds, if not thousands, of similar containers. War is here, and if this isn’t a perfect ending to an excellent season, at least the conclusion lets us know that things are about to get so much worse, in the best possible way. I also haven’t praised the show’s visuals in a while, so: the show looks great.